Hi ya! 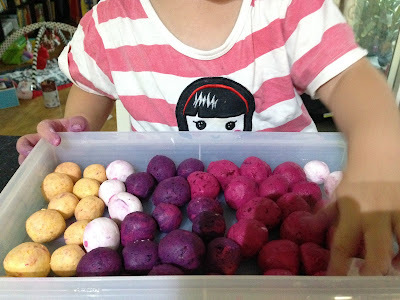 I am counting 汤圆 (tang yuan), a dessert that we eat during winter solstice festival (冬至). Even though it is scorching summer day here in Australia, but mummy says it is a good traditional culture to pass on as it is a time for family to get together. The round 汤圆 symbolises reunion. 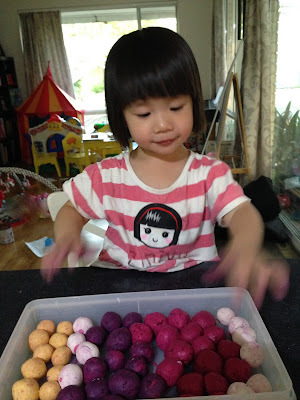 I love the colourful balls made out of glutinous rice flour and mashed carrot/beet root/purple carrot. We cook them in ginger & gula melaka (dark palm sugar) soup, and dip with crushed peanuts. Yummy! Have a happy winter solstice 2015! You are a year older! You and Sarah are such lucky girls to have such a wonderful mum who is very good at preparing delicious food and at the same time not to forget Chinese culture.